Bristol Bay, Alaska is one of the most productive marine ecosystems in the world and the source of the world's largest wild salmon fishery. Yet its future is in jeopardy. The proposed gold and copper mine — known as Pebble Mine — would be located at the headwaters of the Bristol Bay, home to caribou, brown bears, moose, and wolves. 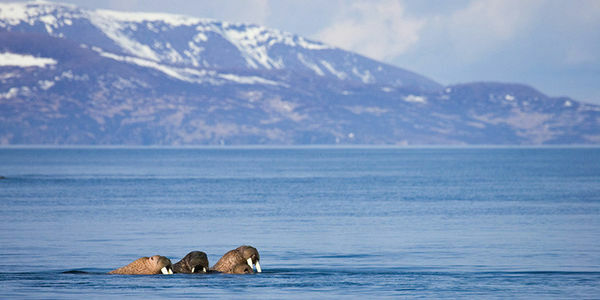 The mine could also impact sea otters, beluga whales, humpback whales and seals. Located in an active earthquake zone, the mine would be the largest open pit mine in North America, if not the world. This must be stopped. Right now, the US Army Corps of Engineers is attempting to fast track the permit application for Pebble Mine. We only have 30 days to gather as much opposition as possible. Tell the US Government we won't stand by while they destroy Alaska's pristine habitat. 1. This application is incomplete. The Army Corps should not issue a Draft Environmental Impact Statement without more information from the Pebble Partnership. There is no baseline information for significant parts of Pebble's proposal, including the proposed transportation corridor, port or use of Lake Iliamna. Any baseline data Pebble has supplied is more than 10 years old and is not a reasonable basis on which to analyze project impacts. The Pebble Partnership should also provide an independently prepared economic feasibility analysis. This is routinely done for other mines like Donlin and, without it, the Corps could be analyzing and the public could be commenting on a hypothetical mine. To proceed with the National Environmental Policy Act (NEPA) process under these conditions is a waste of government resources and of the people's time. 2. The Environmental Protection Agency found that a mine smaller than what Pebble is currently proposing would pose "significant and irreversible harm" to Bristol Bay's waters and would result in "a complete loss of fish habitat." Pebble's current plans will permanently destroy 4,000 acres of wetlands and more than 5 miles of anadromous streams, levels that exceed EPA's proposed restrictions on the mine. The Army Corps must compare Pebble's plans to the EPA's analysis before moving forward with permitting. 3. The Army Corps must look at a range of alternatives beyond Pebble's mine site and include alternatives for mining copper and gold somewhere other than Bristol Bay. 4. The Army Corps should use a realistic scope of Pebble mine to assess its impacts. Pebble asks the Corps to limit the review to an unreasonably small 20-year mine, while it touts to potential investors that the mine can operate for 200 years and produce 11 billion tons of ore. The Army Corps must look at the full extent of mining the Pebble deposit, and not ask the public to participate in a process that is founded on a permit application that is missing such basic components. Please stand with American jobs, Bristol Bay communities, and the millions of Americans that understand the value of these waters. Please reject Pebble's permit application as incomplete, lacking environmental and economic baseline data, and lacking the information needed for government agencies to assess the massive amount of impacts that Pebble is proposing. After just one week, the Army Corps of Engineers is feeling the pressure thanks to you! You demanded the Army Corps of Engineers stop fast-tracking this process and instead take the appropriate time during each phase to assess whether Pebble Mine should be allowed to continue. The Army Corps announced over the weekend that it will extend the comment period an additional 60 days. Please share this action with your friends and family so we can stop the Pebble Mine!